Bibliothèque du Palais de la Paix | Blog | What Future for Western Sahara ? There is no prospect of resolving the decades-old conflict between Morocco and the Sahrawi independence movement Polisario on the future of Western Sahara. The Secretary-General of the United Nations, Mr. Ban Ki-moon, came to this conclusion in a gloomy report, dated 6 April 2010, to the Security Council. Ban Ki-moon reported that "it is clear that neither side is willing to accept another proposal as the only basis for future negotiations". Informal meetings between the two parties in August 2009 and February this year led to nothing. Nonetheless, Mr. Ban says that his personal Envoy for Western Sahara, Christopher Ross, has been "laborious" in his efforts to promote a mutually acceptable political settlement that will provide for the self-determination of the people of Western Sahara in the context of arrangements consistent with the principles and purposes of the Charter of the United Nations. The S.-G. recommends that the Security Council extend the mandate of the United Nations Mission for the Referendum in Western Sahara (MINURSO) until 30 April next year, saying it is indispensable for the maintenance of the cease-fire in the dispute. In the waning days of General Franco’s rule, Spain began rapidly and even chaotically divesting itself of most of its remaining colonial possessions. After initially being violently opposed to Spanish Saharan decolonization, Spain issued promises of a referendum on independence by 1974-75. The nascent Polisario Front, a national liberation movement that had begun fighting Spanish rule in 1973, had been demanding such a referendum. At the same time, neighbouring Morocco and Mauritania declared having historical claims of sovereignty over the territory of Spanish Sahara. A third neighbour, Algeria, viewed these demands with suspicion. After arguing for a process of decolonization guided by the United Nations, the Algerian government backed the Polisario Front, and opposed the Moroccan and Mauritanian claims. The UN attempted to settle these disputes through a visiting mission in late 1975, as well as by requesting the International Court of Justice(ICJ) to give an advisory opinion on the matter. 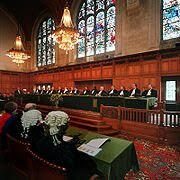 On 13 December 1974, the UN General Assembly requested the ICJ for an advisory opinion on the question whether Western Sahara was a territory belonging to no one (terra nullius) at the time of the colonization by Spain. And if not, what legal ties existed between the territory of Western Sahara and the Kingdom of Morocco and the Mauritanian entity. In its advisory opinion, delivered on 16 October 1975, the Court replied to the first question in the negative. In reply to the second question, it expressed the opinion that the documentation presented to it showed the existence of legal ties of allegiance between Morocco and some of the tribes living in the territory of Western Sahara. They equally showed the existence of certain rights, which constituted legal ties between the Mauritanian entity and the territory of Western Sahara. However, the Court concluded that the documentation presented to it did not establish any tie of territorial sovereignty between Western Sahara and Morocco or the Mauritanian entity. With its opinion the Court did not find any legal issue of such nature as might affect the application of UN GA resolution 1514 (XV) – containing the Declaration on the granting of Independence to Colonial Countries and Peoples - in the decolonization process of Western Sahara, and of the principle of self-determination of the Sahrawi people. On November 6, 1975 the so-called Green March into Western Sahara began when 350,000 unarmed Moroccans converged on the Southern Moroccan city of Tarfaya and waited for a signal from King Hassan II of Morocco to cross into Western Sahara. Meanwhile, the Spanish government secretly negociated and signed a tripartite agreement, known as the Madrid Accords, with Morocco and Mauritania as it intended to abandon the Territory on 14 November 1975. 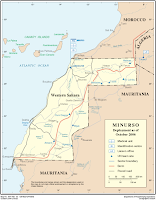 Although the accords foresaw a tripartite administration, Morocco and Mauritania each moved to annex parts of the territory, with Morocco taking control of the northern two-thirds of Western Sahara and Mauritania taking control of the remaining southern part. Spain terminated its presence within three months. Morocco and Mauritania, however, met staunch opposition from the Polisario. In 1979, Mauritania was forced to withdraw, but Morocco extended its control to the rest of the territory and gradually contained the guerrillas through setting up an extensive sand-berm in the desert. 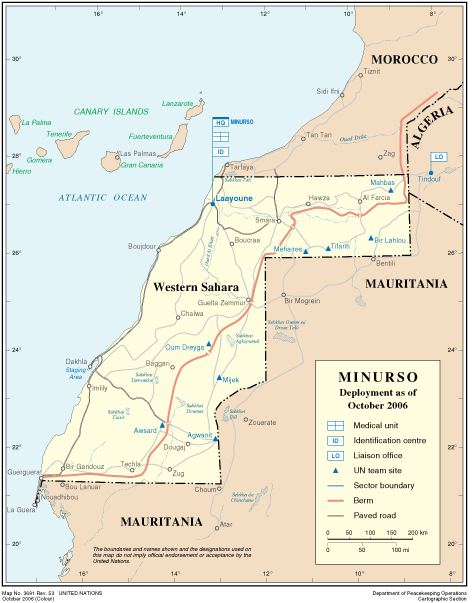 Hostilities ended with the 1991 cease-fire, overseen by the peacekeeping mission MINURSO, under the terms of a UN Settlement Plan which included a referendum on the future of Western Sahara, giving the local population the option between independence or affirming integration with Morocco. The referendum was scheduled to take place in 1992, but was never held because both parties could not agree who would be eligible to vote. In 1997, negociations under the auspices of the United Nations were held in Houston, Texas. The outcome was an agreement (Houston Agreement), which attempted to clear the path for the referendum to be held in 1998. A comprehensive electoral census was published, but as its results were rejected by Morocco, the process was frustrated again. The S.-G. consequently suspended the Settlement Plan. Other solutions were sought by the S.-G.’s Special Envoy James Baker in 2001 and 2003, but these also remained without result. ch on the occasion of the thirty-fourth anniversary of the Green March, King Mohammed VI reaffirmed the commitment of his Kingdom to its autonomy proposal. Polisario directly reiterated its position on the "inalienable right" of the Sahrawi people to self-determination through a referendum. And by such, the impasse on Western Sahara remains. 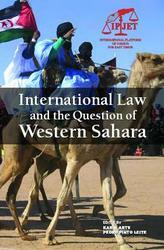 Abstract: In follow-up to the Conference on this subject at ISS in October 2006, the book on International Law and the Question of Western Sahara was published. According to former US Ambassador and former deputy Chairman of the UN Peacekeeping Mission for Western Sahara Frank Ruddy, the volume edited by Karin Arts of the Institute of Social Studies and Pedro Pinto Leite of the International Platform of Jurists for East Timor “goes a long way to putting Western Sahara on the geo-political map for those unfamiliar with the issues, and for the rest of us, it explains why this 30 year old conflict is so important, not only to the Sahrawis but to the great powers. It also emphasizes why Western Sahara is not a sideshow to be patronized by the U.N. as it concentrates on other hot spots in the world.” The situation in Western Sahara brings up highly complex and challenging questions which among others relate to the status of the territory under international law, the implications of the right to self-determination, respect for human rights and protection against human rights violations, and the lawfulness and/or legitimacy of natural resource exploitation. These are all issues addressed in the book which apparently is the first collective work in English on the international legal aspects of the question of Western Sahara.